London, UK – At a meeting with investors and financial analysts today in London, Royal Philips (NYSE: PHG, AEX: PHIA) will update the financial markets on the Group’s Path-to-Value and focus on developments in the Lighting and Consumer Lifestyle businesses. 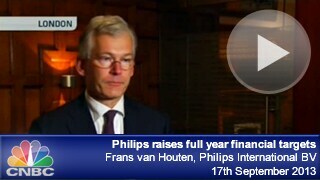 As part of his company update, Philips Chief Executive Officer Frans van Houten will update the markets on Philips’ progress to date, and the Path-to-Value towards its new 2016 mid-term financial performance targets. Mr. Van Houten will further talk about the additional steps Philips will take on its Path-to-Value such as incremental investments that will enable new growth opportunities and further productivity improvement including better operational performance, more end-to-end productivity gains, increased savings and improved gross margins through smarter sourcing and supply. The new share buy-back program of EUR 1.5 billion will start in October 2013 and will be concluded in the next 2-3 years. All shares repurchased under this program will be cancelled, resulting in a reduction of Philips&apos; outstanding share capital. After the company update, Frans van Houten and Chief Financial Officer Ron Wirahadiraksa will take part in a question-and-answer session with the investors and analysts present in London. Thereafter, Eric Rondolat, Chief Executive Officer of Philips Lighting and his executive team will provide an update on its strategy and the continued actions to strengthen Philips Lighting’s number 1 position in the market. They will explain their strategy to lead the LED revolution, win in the consumer market, develop integrated lighting systems and services for the professional market and execute on the Accelerate! program. Subsequently, Pieter Nota, Chief Executive Officer of Philips Consumer Lifestyle and his executive team will re-iterate the continued focus on Personal Health and Well-being appliances and services. They will elaborate on Consumer Lifestyle’s strategy to deliver strong growth and improved profitability enabled by locally relevant innovation and operational excellence driven by Accelerate!. Presentations in London will begin at 09:00 AM GMT (10:00 AM CET) and can also be followed via webcast. Please follow this link to listen to the webcast and download the slides that will be used during the day. This release may contain certain forward-looking statements with respect to the financial condition, results of operations and business of Philips and certain of the plans and objectives of Philips with respect to these items. By their nature, forward-looking statements involve risk and uncertainty because they relate to events and depend on circumstances that will occur in the future and there are many factors that could cause actual results and developments to differ materially from those expressed or implied by these forward-looking statements..